DENT LIFTER: 1. Aluminum body 2. Stainless Steel Adjustment knob 3. Stainless Steel Nuts / Bolts / Pivot pin / E-clips Fixing 4. A screw on the top of the lifter tooth is used to adjust the middle height of the lifter tooth. 5. With sanding oxidation process, smooth texture feel and outstanding looks, the product is very strong and durable. 6. On the bottom of the tooth lifter is silicone, not ordinary rubber, which is very soft and not harmful for oil painting and can be torn down. How to use？ 1,Dent casued by collision,scratch,smash。 2,Choose a tab that,matches the shape and size of the dent. Apply Hot met glue on the center of the tap and in the circle inside and out, and make sule the glue is even and full on the tap. 3, Align the center point of tab with dent center point,then quickly put the tab on the dent and slightly press it till the space between the tap and dent is 1mm,and lossen your grip till it is fastened on the dent. 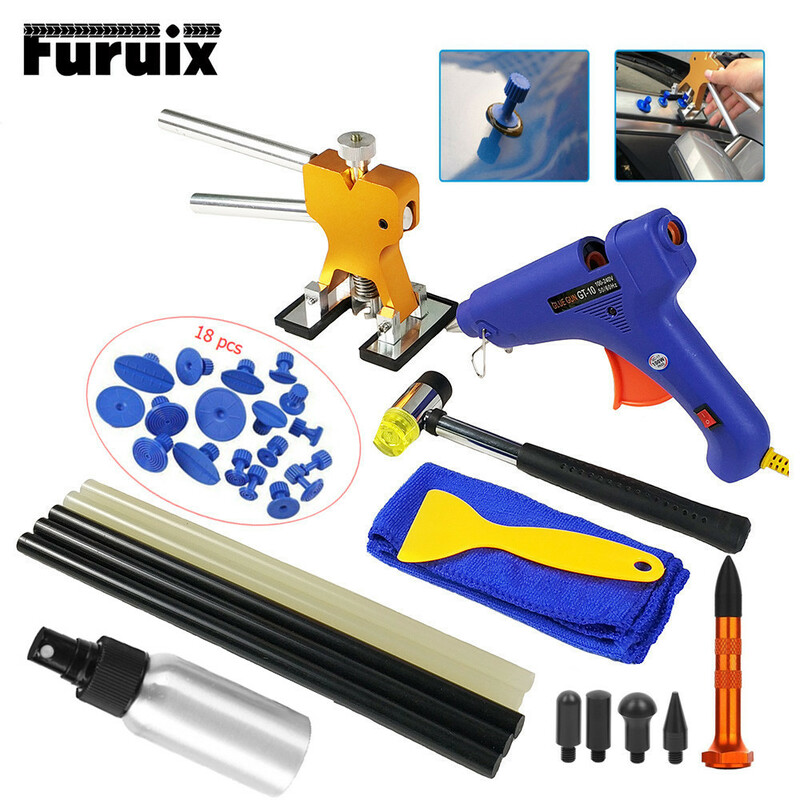 4,Fix the dent lifter which has already been adjust-ed well in the tab,grip the handle,lift up in the equally We accept Alipay, West Union, TT. All major credit cards are accepted through secure payment processor ESCROW. Payment must be made within 15 days of order. If you can\'t checkout immediately after auction close, please wait for a few minutes and retry Payments must be completed within 15 days. All Furuix products are high quality ones. We never contact customer to revise the bad feedback, which we have the confidence to show the real feedback to our customer, so if you have any issue for your order, please contact us, we will provide the 100% satisfied solution for our customer. However if we noted any customer to give us bad feedback (fake feedback) in order to get the full refund, we will pull this customer to the black list and never deal with them in the future.